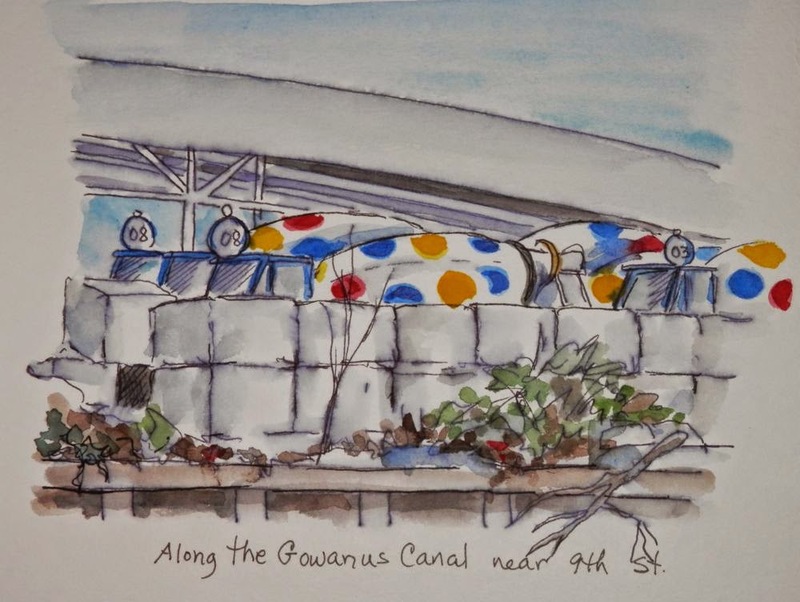 Our destination for the World Wide Sketchcrawl Day was the Gowanus Canal area in Brooklyn. 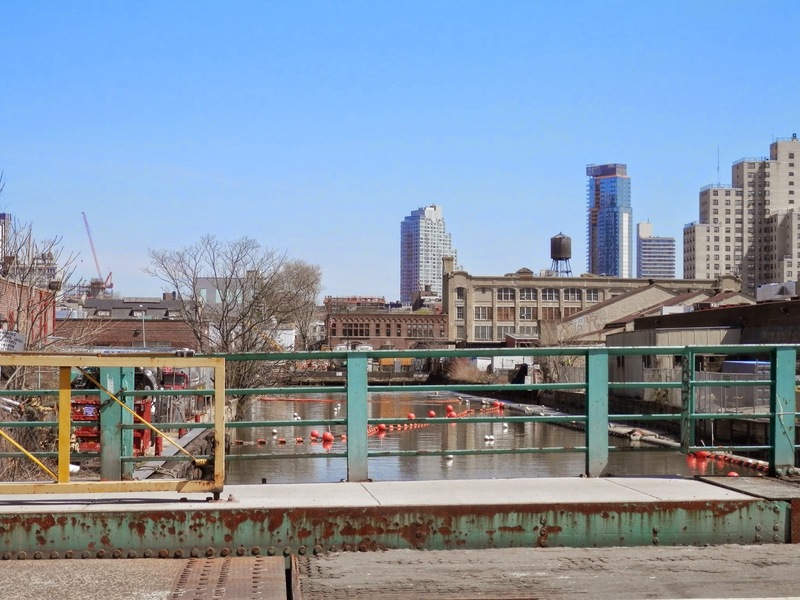 At one time the canal was an important transportation hub, but for years now this area has been known as one of the most polluted bodies of water in the United States. Recent projects have focused on cleaning up the canal and the surrounding areas. The area seems to be getting revitalized with businesses moving in and environmental projects taking place. Susan and I headed to Brooklyn by car, hoping to meet up with the rest of the group somewhere along the line. We were sorry that didn't happen, but at least we were joined by Sunil for a while. Our day started by the Union Street Bridge, the northern most bridge that crosses the canal. 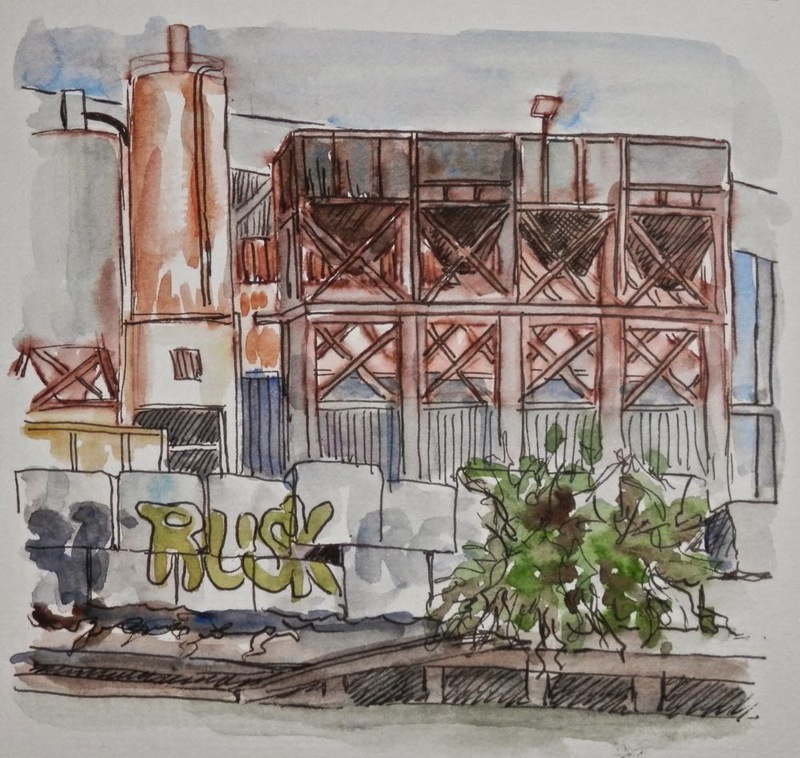 It had a very industrial, gritty (a kind word) look to the area along the canal. I usually like sketching much prettier locations but I really got into the odd buildings and structures. While we were sketching we met a teacher who was there with some young kids and their parents. He was doing a lesson in perspective with the kids and it was fun to see the sketches they had done while sitting on the bridge. Here is my first sketch. 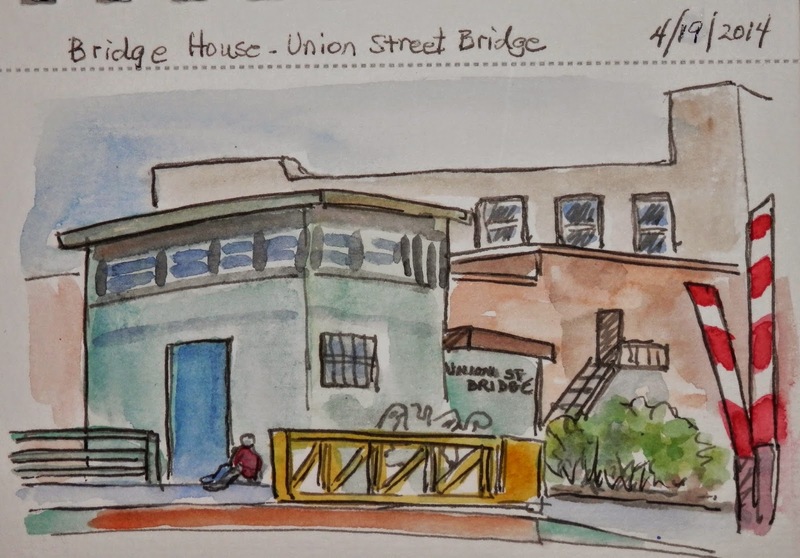 I also did a sketch of the bridge house. Here is a photo of the actual view. Next we headed over to the Ninth Street Bridge area. 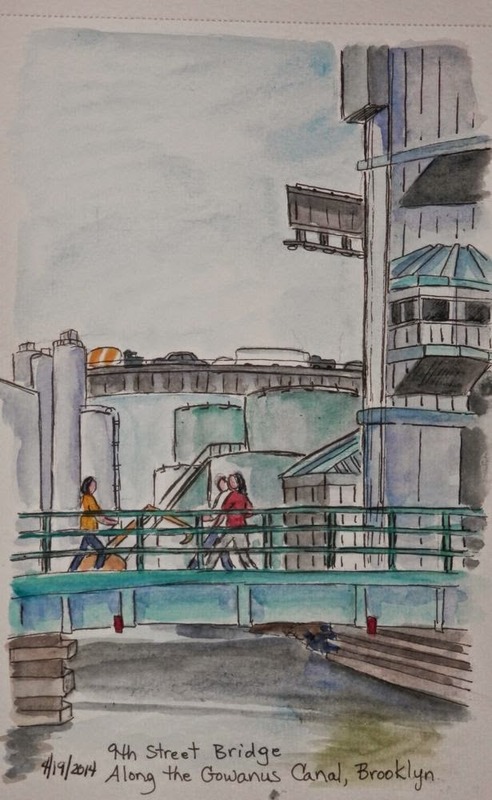 I did a sketch of the bridge with the oil tanks in the background and the elevated BQE and the traffic passing by. Sunil joined us here. He is so good at sketching standing up. I like being comfy in my chair. The industrial look with the assorted tanks and bins caught my eye. Even the graffiti on the cement cubes looked interesting. While I was sketching this scene above we heard voices calling us. It was the rest of the group that we were hoping to meet. They were up on the subway platform above the bridge. 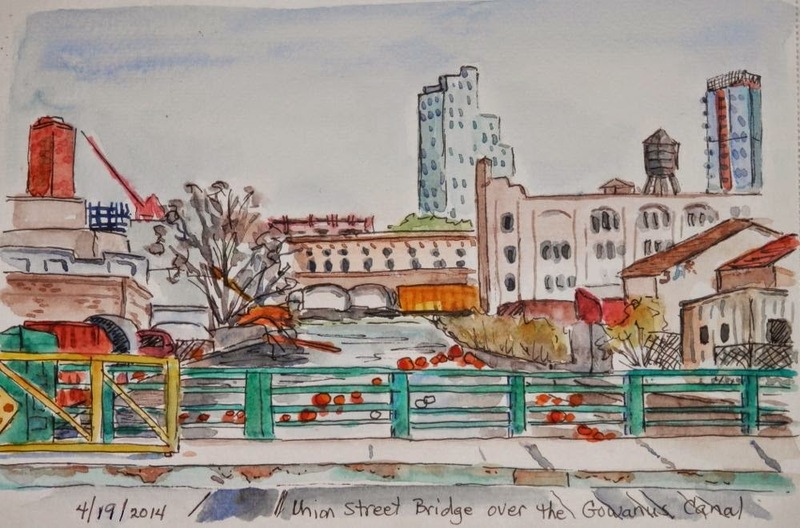 Since they were on the way to do something in Long Island City next, we didn't get to spend any time sketching together. Right alongside the view above were some cement trucks...why not sketch them? Don't you just love the colorful dots? Our last location for the day was near the Whole Foods Market on 3rd Street. A parklike walkway was around the parking lot offering some views of the surrounding buildings and the 3rd Street Bridge. I did a double page spread of that view. It was sketched on the spot but since it was getting late I finished it when I got home. 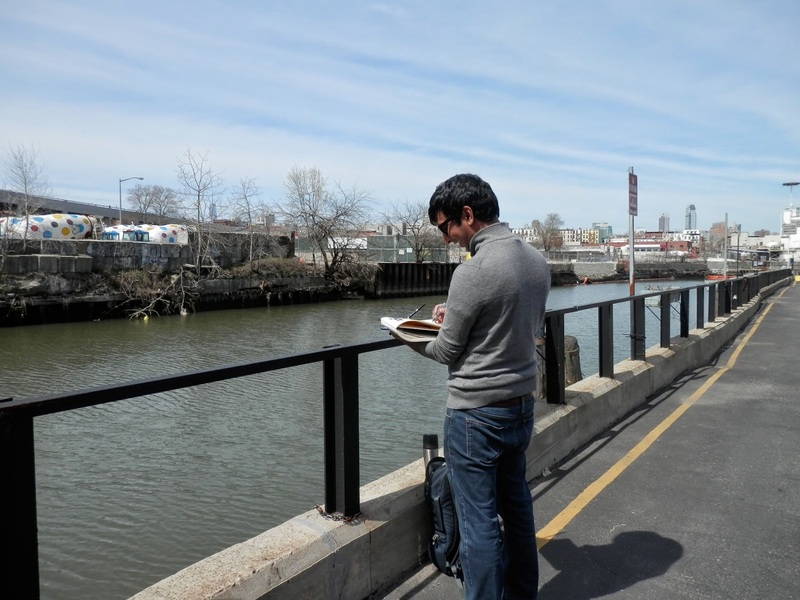 I definitely got a lot of sketching done along the Gowanus Canal. Excellent water color work, patiently done, more closer to photo. We missed you in our team. Thanks Swami and Jim. Wish we had all linked up again. Great sketches, Joan! You did a good job with all the complicated architectural stuff, and I like that you stayed to paint the polka dotted cement trucks. They definitely add a touch of whimsy.